Let's share Earth Day with the rest of the year! One specific way to help the earth is to make more eco-friendly decisions while grocery shopping. In particular, we want to focus on picking products with the best packaging for the earth. Using the great resources at ChooseCartons.com regarding tips and trips about recycling and why cartons are a good packaging choice, I discovered more about paper cartons and eco-friendly packaging. Click on "read more" to read these shopping tips below and learn how to enter to win a Trek Bicycle from Evergreen Packaging! One of the easiest ways that we can choose eco-friendly packaging is to look for packaging with an earth-friendly manufacturing process. For example, paper for cartons are made from trees from carefully and responsibly managed forests. Packaging made from recycled materials also does not take such a toll on the earth as products packaged in new packaging. In addition, we as shoppers should search for groceries that come in packaging that is easy to recycle. For example, hard molded plastic is not something that is allowed to be recycled locally for me. However, other types of plastic containers, bags, paper, and cardboard can be recycled. When I shop I can look for scissors, for example, that are not packed in a plastic shell, but are instead simply attached to a thin cardboard sheet. Enter to win a Trek Bike! Evergreen Packaging is encouraging shoppers to make more eco-friendly choices at the grocery store by offering the opportunity to participate in the "Choose Cartons" campaign on Facebook! 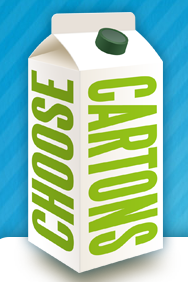 Participants can like the "Choose Cartons" page, and can also leave a comment about ways to be a greener shopper. After liking and joining, enter to win the grand prize of a Trek bicycle (valued at $900) or another one of their weekly prizes! Good luck and happy eco-friendly shopping!